WE GIVE GREAT MULTIPLE PC SHIPPING DISCOUNTS !!!!!! WE HAVE OWNED A RECORD STORE FOR OVER 25 YEARS WE KNOW HOW TO GRADE CORRECTLY. ALL RECORDS ARE SHIPPED IN HEAVY DUTY RECORD BOXES ! 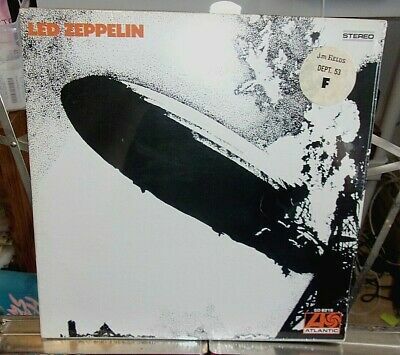 LED ZEPPELIN: I ORIGINAL SD 8216 (SEALED Vinyl LP) 1969 WITH STORE STICKER This is a STILL SEALED original Led Zeppelin debut album, catalog number SD 8216. Original 1841 Broadway address. It is in absolutely beautiful condition. Oh so beautiful and oh so rare. Recorded at the end of 1968 and released at the begining of 1969. A stellar begining to the illustrious career of the might Zeppelin. The only flaws are a very small tear of the shrinkwrap and slight corner BUMP at top left. NO HOLES, NO CUTS (NOT A 180 GRAM REISSUE) NOTE: WE RECENTLY HAD A RECORD FROM THIS SEALED COLLECTION COME BACK TO US DUE TO A SPLIT INNER SLEEVE . PLEASE UNDERSTAND THAT IN RARE CASES INNER SLEEVES CAN BE SPLIT EVEN THOUGH THE RECORD IS FACTORY SEALED THIS CAN HAPPEN DUE TO THE RECORDS BEING MOVED OVER MANY YEARS AND THE SHIFTING OF THE VINYL INSIDE THE INNER SLEEVE CAN SOMETIMES CAUSE A SPLIT. FOUND IN A CLIMATE CONTROLLED STORAGE UNIT IN SOUTH FLORIDA ALONG WITH MANY OTHER SEALED GEMS ! Sealed (S) LP PERFECT still sealed- SEALED COVER may have sawcuts, drill holes BUMPED CORNER etc. Near Mint (NM) Opened but played only a few times MAY HAVE PAPER SCUFFS FROM THE INNER SLEEVE. GREAT LUSTER A TRUE TOP COPY. NM COVER - HAS VERY minor wear no rips,no ringwear,no ink. Very Good ++ (VG++) LP Minor wear MAY HAVE LIGHT SURFACE SCUFFS that don't affect playback. GREAT LUSTER .LOOKS AND PLAYS GREAT. Very Good + (VG+) LP Will have minor background noise, MAY HAVE occasional pop and tic. NOT A COLLECTORS ITEM but Still a nice listening copy. VG+ COVER Seam wear or minor splits, may have ink ,tape, General common shelf wear . $4.00 for the first album and $1.00 for each additional album purchased. Double albums count as ONE! Up to 5 albums $22.00 for the first album and $5.00 for each additional album. Double albums count as ONE! 5 or more albums are shipped USPS Priority International and will be charged by weight. Up to 5 albums, $15.00 For the first album and $3.00 for each additional album. Double albums count as ONE! 6 or more albums are shipped USPS Priority International and will be charged by weight.